It's been utterly fascinating to witness the speed and consistency of the vitriol heaped on Sonia Sotomayor, President Obama's choice to replace David Souter on the United States Supreme Court. Since Obama made his nomination public last week, the right wing attack machine's kicked into high gear, acting like a collective bunch of rapacious vultures circling above Sotomayor like she's some fly-infested roadkill. Sotomayor's critics are waging a multi-front war, consisting mainly of charges of racism and judicial activism, despite the fact that nothing in the jurist's record of roughly 400 decisions supports either claim. "Imagine a judicial nominee said 'my experience as a white man makes me better than a Latina woman' Wouldn't they have to withdraw? New racism is no better than old," Gingrich said, adding, "A white man racist nominee would be forced to withdraw. Latina woman racist should also withdraw." But there's no "there" there. Both Justices Clarence Thomas, Antonin Scalia and Samuel Alito have made similar comments about their ethnicity and how it's shaped and influenced them, as it should. Can someone tell me the difference between Sotomayor's comment and a statement Alito made during his 2006 confirmation hearing? : "When I get a case about discrimination, I have to think about people in my own family who suffered discrimination because of their ethnic background or because of religion or because of gender. And I do take that into account." Funny how we didn't get charges of racism levied at Alito from our hypocritical Republican pals. The notion that a liberal Puerto Rican woman from a poor New York City upbringing is racist is an absurd and reprehensible accusation. And it shows not only how desperate Republicans are to undermine the Obama administration, but the shameful levels they'll stoop to in doing so. "I will seek someone who understands that justice isn't about some abstract legal theory or footnote in a casebook; it is also about how our laws affect the daily realities of people's lives, whether they can make a living and care for their families, whether they feel safe in their homes and welcome in their own nation. I view that quality of empathy, of understanding and identifying with people's hopes and struggles, as an essential ingredient for arriving at just decisions and outcomes." Conservatives were quick to raise the red flag on the president's "empathy" comment, claiming it demonstrated a radical view of the role of one who sits on the High Court's bench. First of all, the word "empathy" is not a pejorative term to be feared, but rather a human emotion/virtue to be appreciated and admired, especially in the context of making critical decisions which profoundly impact the lives of individuals as well as businesses and governments. We saw what eight years of cowboy arrogance did for the country. Besides, empathy is not a term that only President Obama has introduced into America's judicial lexicon. George H. W. Bush Sr. used it in the same vein when explaining his choice of Clarence "Sexual Harassment" Thomas back in 1991. 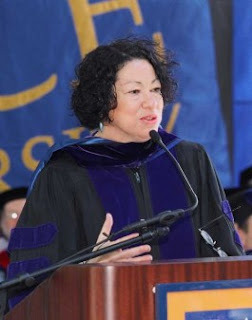 Sotomayor's detractors argue, albeit in shameless partisan fashion, that she's not just racist, but one who'll serve the court as a liberal activist not a strict constructionist who will interpret law and not make it. It is truly ridiculous, naive and unrealistic to think that there's some black and white roadmap that all justices typically follow when hearing and deciding cases. If that were true, there'd never be dissention, never be split votes. The SCOTUS judges would always see things through the same lens and vote unanimously. As we know, that's not what happens. Obviously, the law is gray. And often very gray. With much of it open to the injection of one's personal views and life experiences. Therefore, it's a bit disingenuous, yet not terribly surprising, that "empathy" is at the heart of the Sotomayor controversy. Then there's the attempt to impugn Sotomayor's qualifications. One media wingnut groaned that "there's got to be more of a reason for her getting the appointment than that she's Hispanic and came from a poor family." What a nitwit. Sotomayor brings more federal judicial experience to the Supreme Court than any justice in 100 years, and more overall judicial experience than anyone confirmed for the Court in the past 70 years. Funny how our sore-losing bigoted friends on the right overlook this little factoid when attempting to minimize Sotomayor's credentials and overall merit. Let's face it: what's really at issue here is that rich white men are pissed off at the thought that her appointment was the result of her being Puerto Rican and because she grew up poor. Pretty ironic coming from a segment of the population that holds most of the power in the business, financial, entertainment, political and judicial sectors. They're pissed because this sort of entitlement is usually reserved for them. If a top job's gonna go to someone because of their race, doggonnit it's gonna be them! In case you haven't noticed, rich white men don't like it when their privilege and power is usurped. The south is pissed off. That is the GOP base. Let's hope they continue to go down. The GOP is stuck with their religious zealot racist white base. They are in a corner and it is fun to watch. We need a 2 (maybe 3)party system that works, but the GOP has no wide appeal. They must get rid of the religious zealot racist white base. They need to be the party I grew up with that was for conservative economic issues, but were socially moderate and pro environment. I don't see it happening any time soon. They are operating on keeping the base happy and hoping Obama fails so that enough voters will vote them back in. The right might be stuck with their religious zealots, but we are stuck with the right. Every time i turn around they are undermining my well being, trashing my country, spitting on this nation's ideals, contaminating the world with their vitrol.